Load the following arduino sketch program. We start off by including the <Servo.h> file. This file contains all the coding required for controlling servos to make our life really easy. Next we need to create our servo object. Our servo is to be called servoMain (but it can be called anything you like). Next comes the setup() function and inside we attach our servo object to pin 10. We are now ready to send commands to our servo. In the main loop() function we issue a number of commands to rotate the servo to various positions, with a 1 second delay between each command. 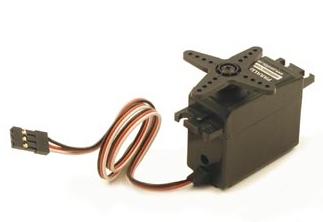 On your servo you will have 3 wires. Normally black, red (center) and either orange or white. Using some single strand hook up wire, connect the black wire to one of the Arduino 0V pins. Connect the red wire (center wire) to the Arduino 5V pin. And finally connect the orange/white wire to pin 10.